With equities on the slide, the VIX built gains, but they were never anything of significance. 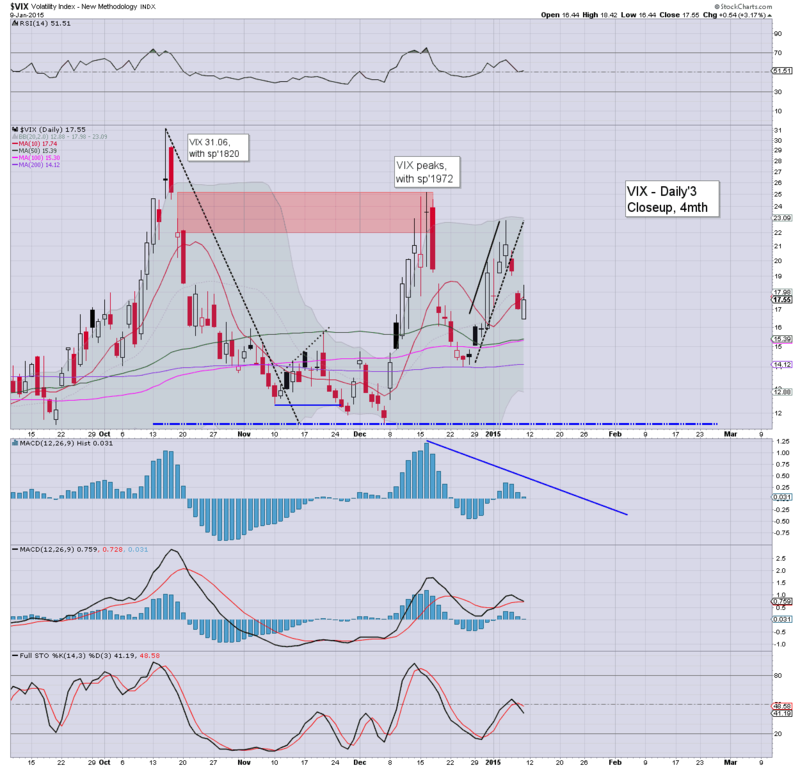 The VIX settled +3.2% @ 17.55 (range 18.41/16.44). Near term outlook is for new equity highs... which should equate to VIX in the low teens.. perhaps 12/11s, if sp'2125/50 zone by early Feb. It would seem sp'1992 was a short term low.. and VIX looks set to remain under the 20 threshold at least until after the next opex. 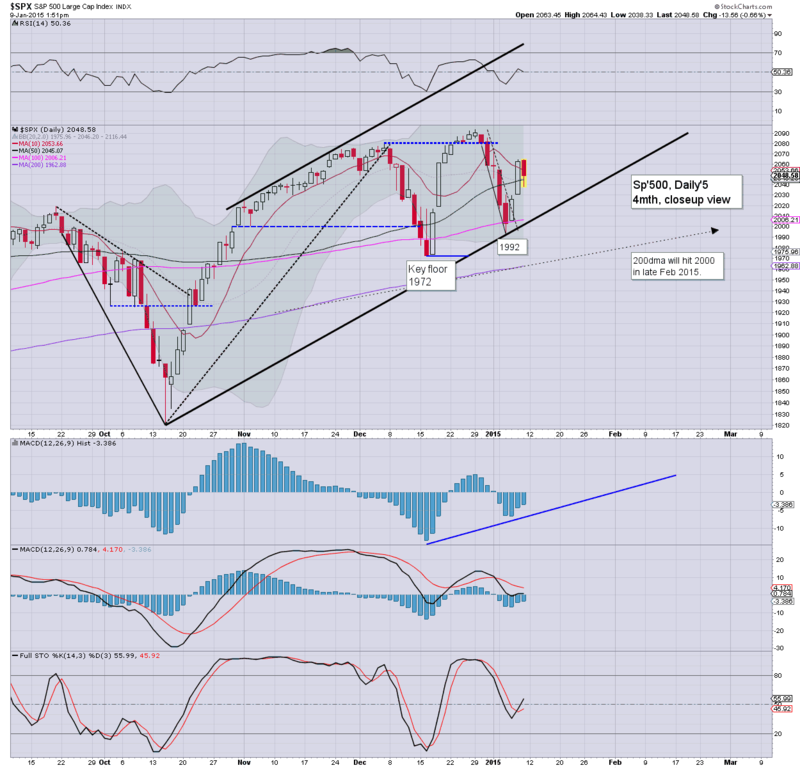 The weekly chart is offering the fourth spiky top candle... and that does not bode well for the equity bears. Despite the many concerns (not least about looming fed rate rises)... the VIX can never hold above the key 20 threshold for very long. US equities closed moderately weak, sp -17pts (intra low 2038) @ 2044. The two leaders - Trans/R2K, settled lower by -1.1% and -0.9% respectively. Near term outlook offers another sig' push higher in opex week.. to the sp'2100s. Metals held sig' gains into the close, Gold +$12... whilst Oil remained weak, -1.4% or so. 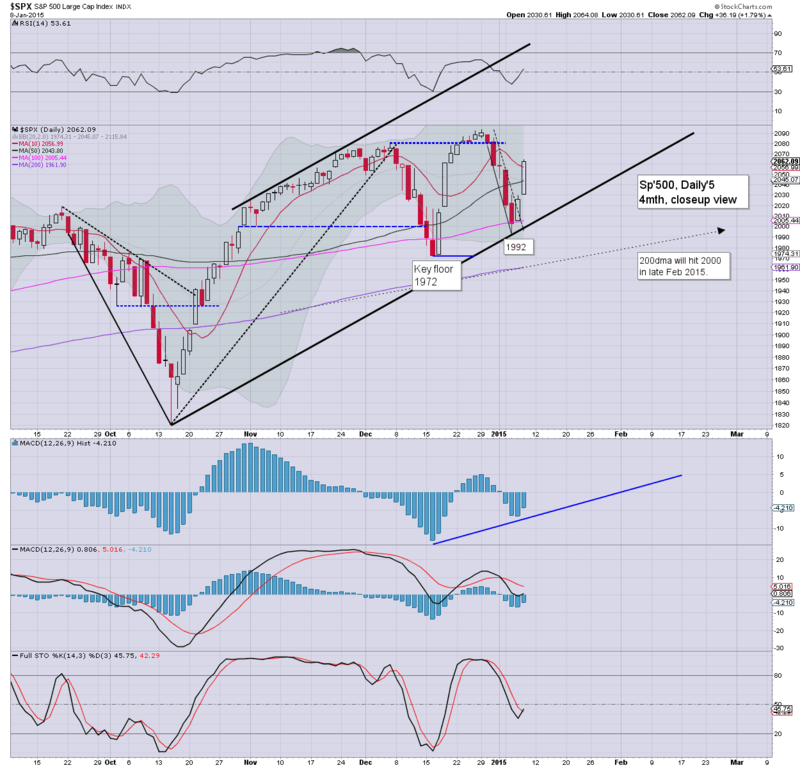 *It will be important early next week that the market holds the lower gap zone... around sp'2025. 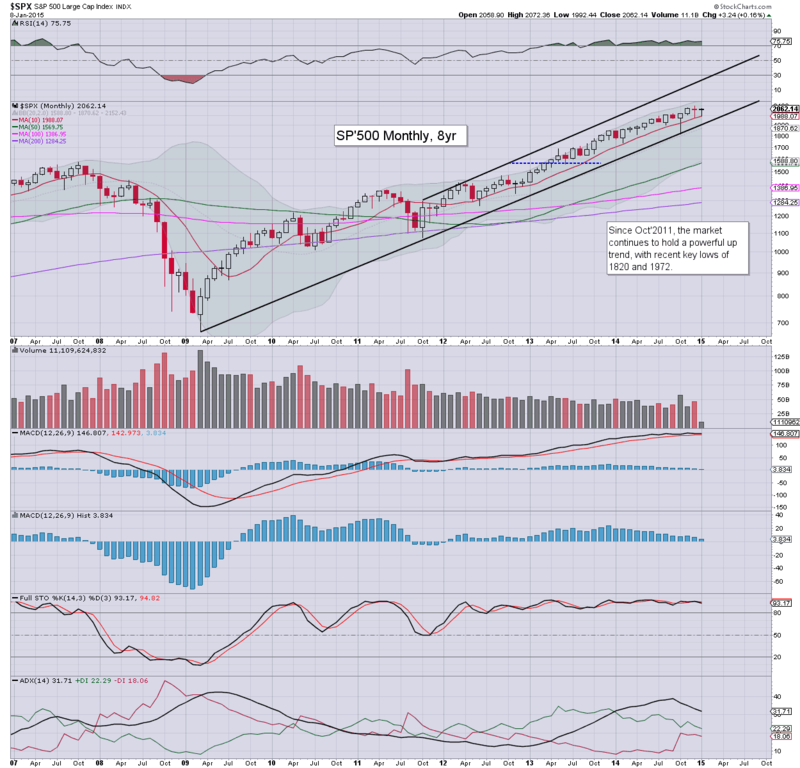 If that is lost.. there is viable threat of another wave lower (call it a C.. or whatever)... to the 200dma in the 1960s. That scenario does seem unlikely though. ...and the first full trading week of 2015 comes to a close. Certainly, the bears had the first two days of the week in their favour.. with a cycle low of sp'1992, but the rebound was powerful.. and the sp'2100s look viable into next Friday's opex. the usual bits and pieces to wrap up the week... across the evening. An interesting week... we broke lower than I had expected... but the strong rebound from sp'1992 was not a surprise. 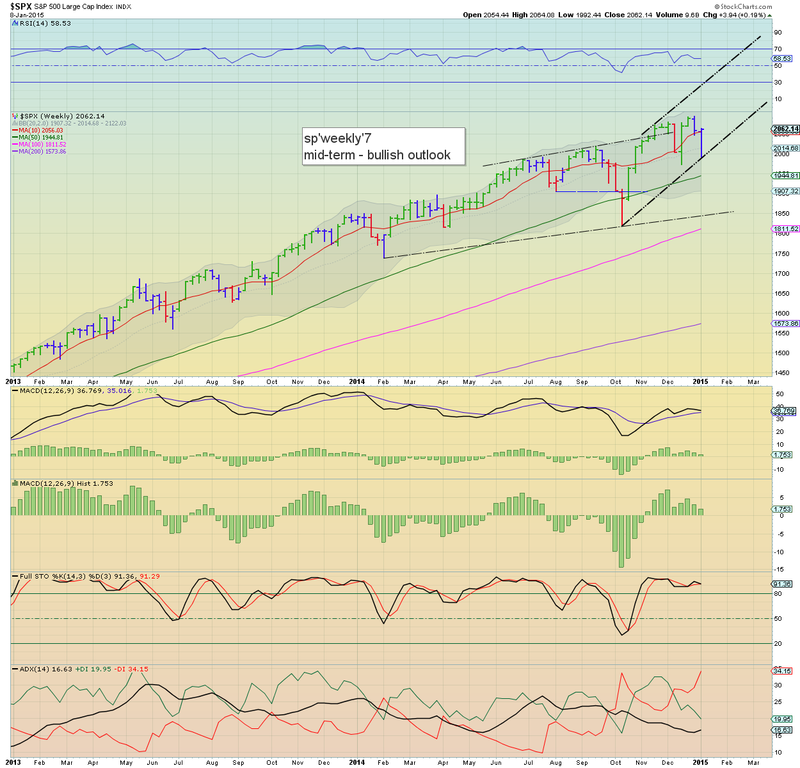 No matter how twitchy the market might get... the underlying broader upward trend remains the case. 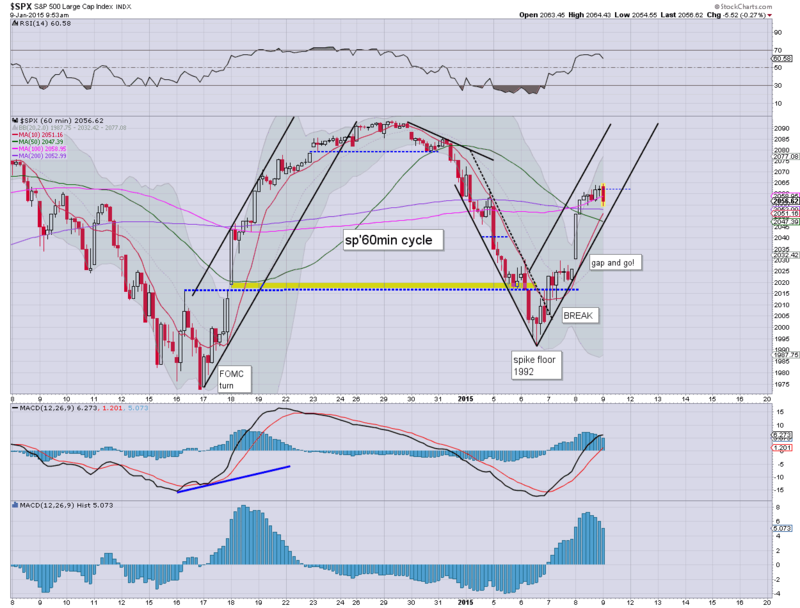 US equities remain moderately weak, but the smaller 15/60min cycles are offering upside into the remainder of today. A daily close in the sp'2050s will still make for a massive bullish recovery.. from the Tue' low of 1992. VIX remains a key tell... and is set to close moderately red... in the 16s. No doubt some were getting overly excited this morning.. but any close >2052.. will make for a clear 3% net gain since the Tuesday afternoon low. *I remain long.. seeking a somewhat exit than this.. will hold into next week. The upper end of the rather large price gap @ sp'2042 has been filled. The smaller 15/60min cycles are offering a latter day rally. 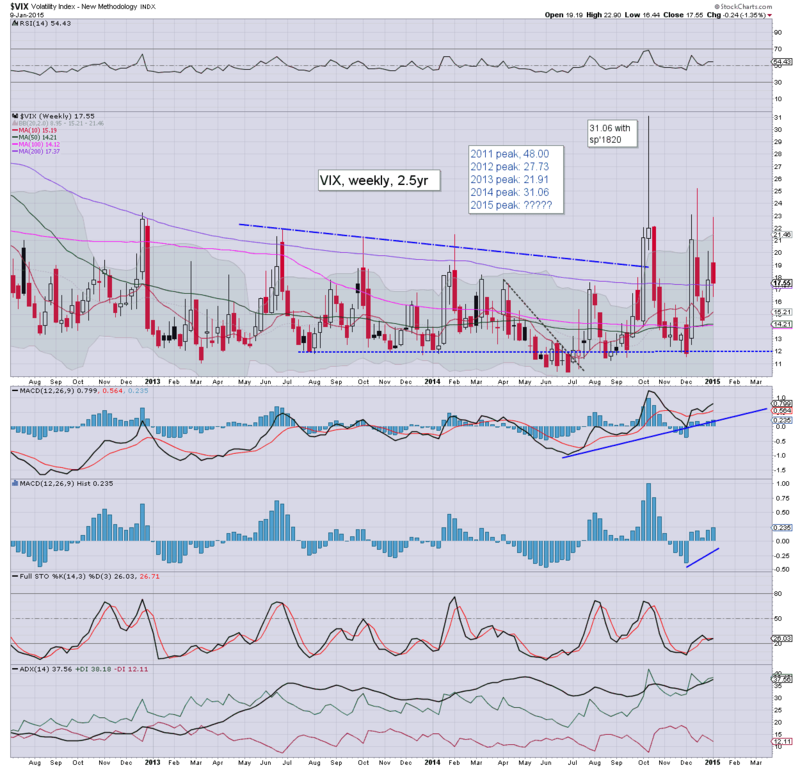 VIX remains only a little higher.. and is not supportive that a lower high (sp'2064) has been put in. Broad upside into next opex seems probable... to the sp'2100s. 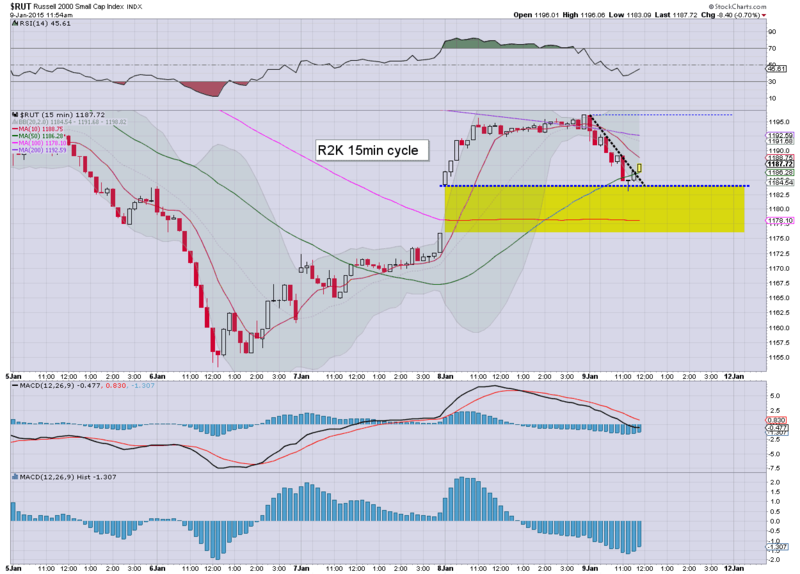 *the actual $spx chart does not properly show the price gap... R2K is clearer... or SPY (but I don't chart that... I can't cover it all!). After a hyper ramp from sp'1992 to 2064.... this morning's cool down is not exactly unexpected. Regardless... we look set for higher levels. VIX update from Mr P.
An interesting opening 90mins.. but really. anyone seriously want to get overly bearish here? Arguably, it is merely a 'last ditch' place for remaining shorts to exit.. and for anyone who wants to get long.. to jump aboard.. for opex week. So.. opening weakness... but given a few hours... we'll likely turn positive... and manage the third consecutive net daily gain. Price structure on the hourly is a bullish F flag... there is little reason why market will be able to break <2050... and remain there. 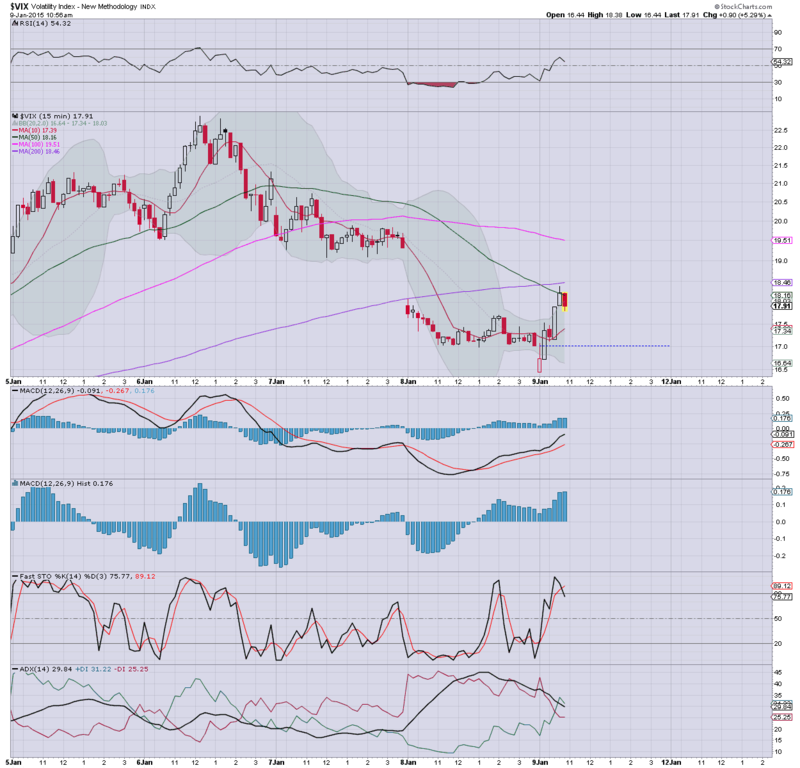 Notable weakness, retail, M, and SHLD, both -3% or so. *posted before the jobs data, and no doubt, Mr Market might see a recovery between now and the open. Well, a minor down open was always a minor threat, but I still expect the market to battle back higher later today. 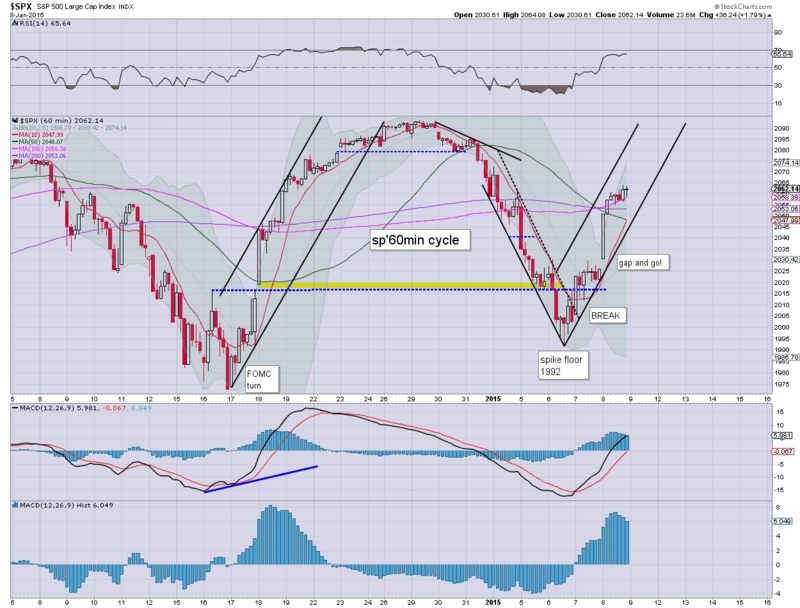 Today is only day'3 in this latest cycle, and as many recognise, we could easily battle upward into next Fri' opex. 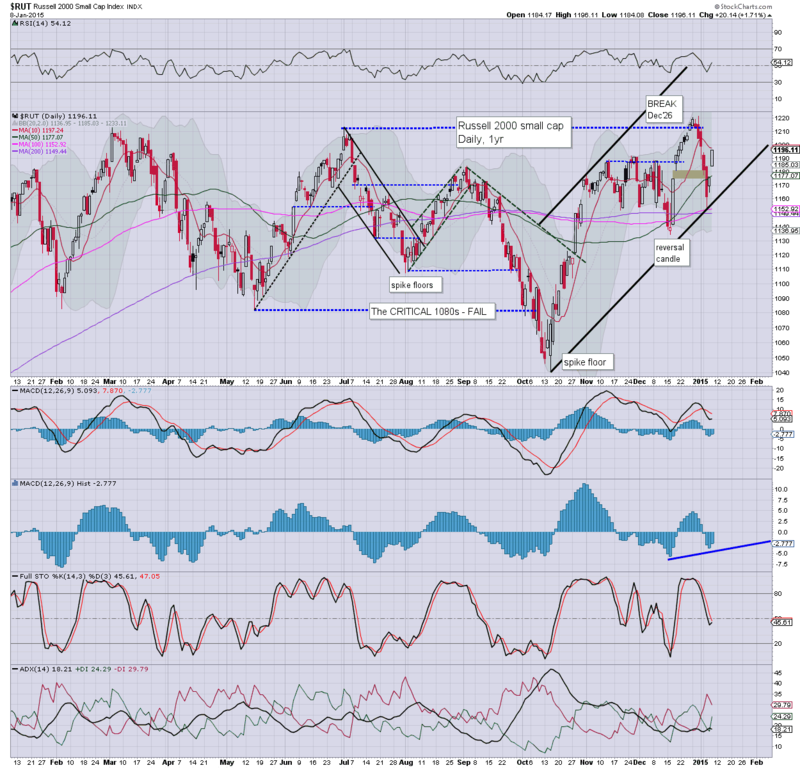 *a retrace back to the price gap of 2030 look VERY unlikely for least a week or two. Update from an overly happy Mr C.
Arguably, a goldilocks number. Indexes clawing back upward. The Wed' gains were interesting, but Thursday really showed the underlying upside power, with the sp'500 breaking into the 2060s.. a level almost unthinkable this past late Tuesday morning. The sp'2100s look highly likely within the near term. *with a second day of strong gains, the weekly 'rainbow' candle has flipped from red to blue. What is clear... sp'1992 now makes for a very clear spike floor. It has been a rather remarkable two days of gains. As has been the case in the previous two down waves, the rebounds are stronger.. and faster than the down waves. Friday will see the monthly jobs data.. market is seeking net gains of 245k, with a slightly lower headline jobless rate of 5.7%. Those estimates do not look overly bold, and I'd expect the data to come in better than expected. There is also wholesale trade data. *Fed official Lacker will be speaking on the economic outlook around 1pm... its possible that might be an extra reason for the market to move, with another tranche of short-stops in the 2070/80s. Good news is bad news? Reading around today, I'm seeing a fair bit of chatter along the lines of 'ohh, the market will sell down on the jobs data'. Really? Today was only day'2 to the upside, and typically, this market can quite comfortably rally for 5-7 days. Even if the market opens somewhat lower tomorrow, considering the past two days of price action, a third consecutive daily gain looks highly probable. *I am long the market, via the R2K. As ever.. with the weekend looming... I might well exit into the weekend, and then start afresh next Monday. US equities saw a second day of increasingly strong gains, sp +36pts (1.8%) @ 2062. The two leaders - Trans/R2K, settled higher by a significant 2.1% and 1.7% respectively. Near term outlook is for the sp'2100s. New historic highs look highly probable by next Friday's opex.